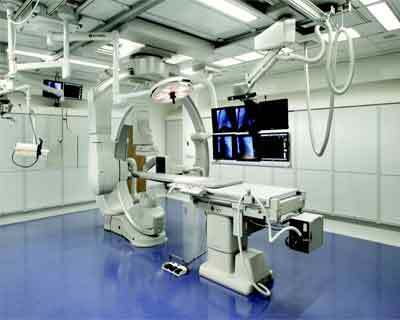 Kerala: A new cath lab and advanced invasive cardiac unit has been started in Ernakulam General Hospital recently. The new health units were set up at a sanctioned amount of Rs 5 crore by the state government. Health Minister KK Shylaja is reported to be present during the inauguration ceremony held yesterday. With the new infrastructure in place, angiogram and angioplasty can now be performed on the premises of the hospital. Earlier patients were sent to the state’s Palakkad District Hospital or other medical college hospitals in situations of emergency. Two cardiologists were reportedly attending to almost 50 patients on a daily basis. 250 patients have so far got an implant of stents and pacemakers done at the Palakkad Hospital. Need for a cancer institute in the area has led members of the Krishna Iyer movement to write to the Chief Minister Pinarayi Vijayan demanding that a cancer institute and research centre be set up in the district. The state government is reported to have confirmed establishment of a cancer institute in Central Kerala in the 2013 state budget. The new cancer centre was to be set up along side the two cancer institutes already functioning in Central Kerala. Speaking after inaugurating new the cathlab and advanced intensive care unit at Ernakulam General Hospital , Shailaja said to the Express that, “such a facility will be helpful when patients are rushed to hospital in emergency situations. In phase-II, the project will be implemented in seven districts, including Ernakulam,” said the Minister, adding that the government had started inspecting the taluk and district hospitals in the State. “Government hospitals are still functioning with the staff pattern set in 1961. A change in staff pattern is essential to make functioning of the hospitals more effective. Despite Kerala being the best in the country in public healthcare, almost all hospitals in the State are over-crowded,” said Shailaja, adding that the government’s aim was to provide better treatment at reasonable cost. The Minister also implied in her statement that the government is mooting over the decision to make government services compulsory for students completing their medical PG courses. This is in view of government facing difficulties in getting specialists to serve in the public sector. Even though the government is ready to offer appointments, these specialist doctors are not willing to join. Following which, the government is planning to make the public sector service mandatory for three years. The doctor should consider it in view of serving the society.